So having scribbled the following posts in advance of departing for Arizona, naturally thee news ‘O thy weekend broke when Danica Patrick finally revealed publicly that she’s got a new boyfriend whose name is Ricky Steinhouse Jr. Ah Shucks, I’m just wunderin’ what’ll happen when Danica gets PEEVED when she tinks ‘Ricky-boy done turned her, eh? 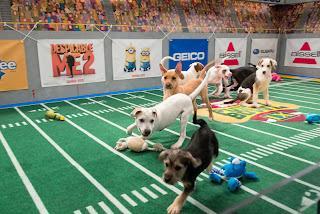 Yet the really breaking news for Mwah, was the discovery of the annual Puppy Bowl that I’d never ever heard of... Thus, if Y’all are hunkerin’ for something different then just another game ‘O smash mouth pigskin this Sunday, then I suggest you dial up the Animal Planet channel and drop in for this year’s Puppy Bowl instead! As I’m sure that ‘GURR-ranimalz ‘LUV-er CARPETS will definitely be checkin’ I-T out, right Dave? Dave? Dave’s NOT here; Oh Never Mind!